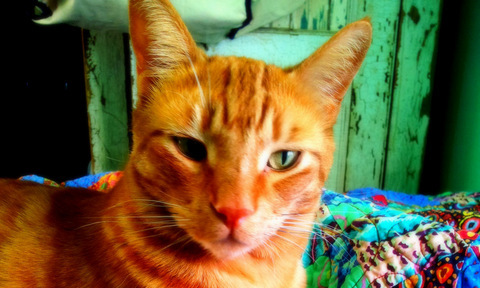 Curious Orange Cat: Hello EQ7 Blog Hoppers!! Welcome. Welcome to my blog! This is my offering to SewCalGal's blog hop. I hope to teach you a new way to use EQ7! So many quilts, so little time. How often we feel this way. I can't tell you how much time I spend on EQ7 just creating away knowing I won't have the time to make even half of these quilts. Well one day I was fooling around with a photograph of my cat. Quilts and cats can be in the same subject! So I took this picture. I know..... he is so photogenic. Stay with me now.. this might get a little complicated. But if I can do it. You can! I opened it in Picasa and "boosted" the color. If you double click on your picture it takes you to an area where you can do fun things with your pictures. OK, so I "boosted" the color, saved it and exported it to a file on my computer. Btw I save it at 150 dpi. I then open it in Photoshop. There are really cool "filters" you can apply to your photos. I went through a few and found "cut out". I applied it to this picture and this is what it did. Pretty cool huh. So I thought if I could do this to photos, what about quilt designs from EQ7. Check this out! 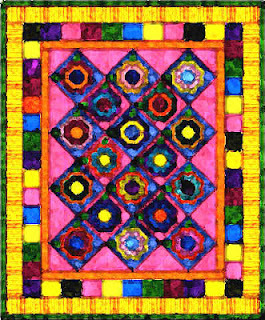 Here is one quilt design I did. Now after I altered it in Photoshop using the "fresco" filter effect. What do you think? Looks like a piece of art now. Pretty cool I say. You can totally do this with other photo altering software. But I find I like Photoshop the best. Don't have Photoshop? You can actually access it online. (in the cloud) It is a bit costly unless you are a student. It is around $75.00 for one month. But if you get all your work ready, you can do quite a bit in a month. Check it out here... Adobe Creative Cloud. There even seems to be a 30 day free trial. I haven't checked it out so if there are any catches, I don't know. But check it out. To this...I used the Posterize effect. So even if you don't have Photoshop, you can still make your designs look like cool artwork. Of course if you are a Photoshop guru you could figure out how to do everything in Photoshop. But I like the "boost" feature in Picasa and then transfer over to Photoshop for the rest. Anyway, what am I doing with all these cool pieces of art? I am printing note cards and selling them on Etsy. You can check them all out at curiousorangecat.etsy.com. However.... just for this wonderful blog hop I am offering a giveaway to one lucky person of a set of 4 of my new note cards. Just go to my Curious Orange Cat Etsy site and then come back here and comment on any product I sell there. Tell me which one you love, hate, wish you had.. ( you don't have to buy anything. I just want you to look). I'll do the drawing and announce the winner here on my blog on October 5. Now get back to designing those quilts! Don't forget to come back here on October 5 to see if you won! And visit Sewcalgal for the rest of the participants in the Blog Hop. Just click on the link here SewCalGal to see who's blog is next! Thank you so much for visiting! This is a really cool idea. It makes my artistic juices flow. Thanks for sharing this idea to make cards of your art work. Amazing. I really like Set of 8 quilt art note cards in your shop! Thanks for the giveaway and for participating in the blog hop! Very fun idea. I'm definitely going to play with this. Thanks for sharing. Just visted your shop (forgot that part)lol. Love the little Tea Pouches. Great site with great ideas! Great way to use 2 great programs! I visited your shop and love both sets of cards! Your hobo bag with the big red flower is neat too! where do you print your cards? at home? the tea pouches would be a great gift for either of my tea-drinking sister!! sisters* (there are two!!) TYPO!! I love your hobo bags! especially the retro one! Clever idea. The retro hobo bag is great. Oh! That is so cool, I love your teabag pouches. Great for taking favourite or special teabags in your handbag! I love the one with circles on it especially. p.p.s. I often play around with Photoshop with my photographs . . it is such fun! Love this effect--will have to try soon!!! EQ7 ROCKS .... so many options, so little time !!!!! I need to start learning to love my EQ7! So many possibilities. Fabulous ideas! Thanks for sharing--it never occurred to me to try something like this. I really liked these ideas. I'll definitely try them. There are some fun filters in EQ! Love your grey bag with the big red flower. I'm loving this hop and all the great ideas that you all are showing us. What a fun idea you have about posterizing. I must try this at the first chance. This is amazing! Thank you for the chance to learn something new to do with EQ! Your little tea pouch is adorable - especially the heart-shaped velcro! Now I will have to add photoshop to this computer and learn how to use it again. Looks like fun. I know, EQ7 rocks! But there is so much that it can do- and it's way cool that you show us this tips and tricks. I have photoshop, but EQ is so much easier and almost as powerful. I love that "cutout" effect. It would be great for making an applique quilt from a photo. Like what you did with your cat photos! There are photo filters right in EQ that you can use on the Image worktable, if you have EQ7, too! Love the artwork on the kitty. My photo program does something similar with the "posterize" option. Lovely cards. Absolutely wonderful idea. Thanks for the inspiration. The cat you are featuring could be my own "Sam the Man". Adorable! Wilson love to be able to quilt him! How ingenious. Technology is great for creativity. Thanks for the inspiration. I know you already announced your winner, just wanted to say I liked this post! Fun! i really need to explore that feature! How funny is that tool, thanks for sharing! Thanks so much for the tutorial on EQ and I would love to win it. What a cool way to use your designs! I have heard nothing but grand things about EQ, something I cannot afford to start with, would love to learn it and use it!